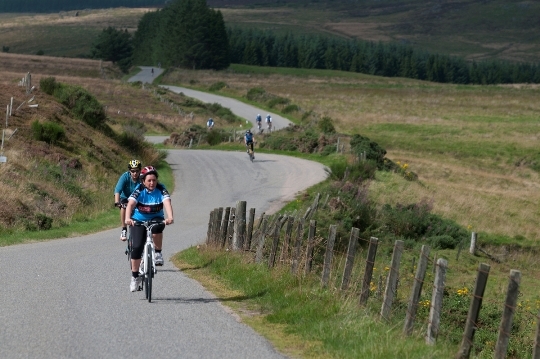 Neil: What was your overall motivation for taking on the Ride the North challenge? Kenna: For over a year I’d worked with the WGPSN team to raise money for the Maggie’s new cancer care centre in Aberdeen. I’d been inspired, motivated and moved along the way and our target had now reached £200K! It was phenomenal what we’ve achieved, but it wasn’t just a number, it was the hearts and souls of people who have all been affected by cancer.But why was I personally motivated, and what drove me to push this campaign and take on this challenge with all my might? Unfortunately, cancer doesn’t discriminate; it visits us all. And it didn’t fail to visit my door when my dad was diagnosed with throat cancer several years ago and was given two years to live. The treatment that was soon to follow and something all cancer sufferers face; operation, radio-therapy, medication… An ex paratrooper, munro bagger, proud man – a harsh reality. But like any true soldier, he took cancer head on and overcame his diagnosis. And next year, I’ll have my dad by my side when I walk down the aisle.Cancer isn’t gone from us though, and although it may have seemed to have passed through our lives, it robbed Dad of his ability to eat forever. It also came knocking this year when a very special girl in my life was diagnosed with breast cancer on the eve of her 30 birthday. So raising money for the Maggie’s Centre in Aberdeen was something very close to my heart and what better way to raise it than signing up for a completely unique challenge such as this. Neil: What was your experience before the cycle? Kenna: My experience before the cycle drew sniggers from my professional teammates as the ‘trumours began to spread’. I was still cycling my hybrid cheap bike and clearing distances initially no further than a matter of miles. I was enjoying the new hobby with gusto, but embracing the social side of cycling, far more than the physical challenge I’d signed myself up for.But, fun cycles to Bieldside with a cheeky wine was to become a thing of the past….Something had to change. A couple of months in, things had turned around and my lazy weekends with my fiancé soon became serious cycles to Ballater and beyond. Neil: What was your confidence levels before the cycle? Kenna: My confidence before the cycle was fair. I knew this would be hard, I knew I’d struggle. I knew I’d finish as one of the final few and I knew I was punching above my weight… Horror stories of exploding ‘back sides’ didn’t help with the apprehension that lurked inside…I also knew that my determination was unwavering, and short of receiving a significant injury, this was a challenge I’d finish, come hell or high water. After all, my motivation, was strong. I was raising money for a cause I believed in, to support my fallen team mate who was waiting at the finish line and to see the look of proud in my dad’s eyes when I completed this. When I finished, I knew it would be something I’d be proud of. Neil: What was your approach to training? Kenna: For me, the most important thing was getting the right bike and gear to succeed. No point setting yourself up for a fall, so I swallowed by pride and at the age of 33, I asked my mum and fiancé for a bike for my birthday. It was the best decision I’d made.After that cycling became a joyous part of my weekend and 20-40 miles cycling didn’t seem like such a distance. I never made it further than that though – before the race. Neil: How did you find the event? Kenna: Amazing, exhausting, memorable, a real endeavor and something I’m very proud of. Much harder than I’d anticipated, but beautiful in equal measure.Over 18 grueling hours of cycling, over hills, and through majestic places – we rode the North… Without a doubt one of the most physically challenging things I’ve ever done in my life. But I kept my promise true and cycled through pain, rain and exhaustion…But complete it we did; and Ride the North didn’t break me, it just made me stronger. I was blown away by the generosity of everyone and raised £1,000 for Maggies – more than I ever thought was possible. I’ll be back next year and the year after to build on this experience and wouldn’t hesitate to tell anyone out there to limber up and get involved.